The mega turret is a giant ground stationary weapon built by the Covenant. It is essentially a long-range, heavy plasma mortar. The mega turret is a massive Covenant plasma turret that was in service during and after the Human-Covenant War. During the height of the empire, the turret was used by the Covenant to protect Covenant military and religious installations, but these massive cannons have also been encountered at remote colonies and outposts guarding nothing of obvious value and reflexively attacking all who approach without long-forgotten authorization codes. The Banished deploy the Mega Turret as a straightforward anti-siege weapon at war camps on the Ark which have the necessary infrastructure and permanence to support their use. It is capable of dishing out considerable damage against hostile forces. It fires three bolts of superheated plasma in quick succession, doing considerably high damage to nearby enemy units. Its appearance, design and function is similar to that of the Type-48 Weevil Artillery Platform. During the Battle for Arcadia, the Covenant deployed a mega turret near one of Pirth City's spaceports shortly before the evacuation ships were due to launch. The turret failed to stop the launch and two of the ships escaped. Another mega turret was deployed in the outskirts of Pirth City, but was destroyed by the UNSC forces from the UNSC Spirit of Fire. During the Battle of the Etran Harborage, the Covenant forces abandoned one of their mega turrets near the exit that led to the surface of the shield world. Several mega turrets were deployed by Merg Vol's Covenant during the Battle of Draetheus V in order to secure a series of bridges at the Epsilon Expanse. At least five mega turrets were deployed during contemporaneous operations on Draetheus V's artificial moon, X50. During the Second Ark Conflict the Banished deployed mega turrets as a straightforward anti-siege weapon at war camps which had the necessary infrastructure and permanence to support their use. They were employed by the Jiralhanae Pavium during the Flood outbreak on Installation 00 to combat the parasite and eventually kill the forming Proto-Gravemind. In Halo Wars the mega turret is a strong and resilient stationary unit. The only instances that they can be controlled are on the campaign level Escape and Skirmish level Tundra. A burst from the turret is strong enough to wipe out a squad of Marines. To destroy one, it is recommended to use units that has a high speed, because they can reach the turret before it fires at them. Another tactic is to attack from its back, since it takes time for it to turn around and fire. One can also exploit its long recharge time, by sending a cannon fodder unit as a distraction for the turret to eliminate, and then attack the turret with full force while it recharges. In the level Escape, the mega turret is located next to the initial Covenant citadel, and can be used to destroy the base. Thanks to its long range of attack, one can also use it to destroy the Scarabs encountered in the level. An additional advantage is that it can fire on targets obscured by "the fog of war", requiring no nearby allies around its target unlike most leader abilities. In order to use the mega turret the player must station an infantry squad inside the structure and pay resources in order to fire it at a location. The player must wait until the turret recharges before they can fire it again. A hidden mega turret is in the level Repairs, but outside of the map since its blasts are being to used to represent those of the Covenant destroyer. The only way to see it is through the Repairs glitch. In Halo: Spartan Assault the mega turret is a stationary unit with strong durability. It can destroy Wraiths in three direct shots and Ghosts in one direct shot, and can also kill player with one direct hit. The only setback is the turret will give a warning where it will fire, giving the player a chance to evade it. The Mega Turret can be destroyed with one C4 explosive or several rounds of anti-armor weaponry; other weapons are not recommended due to its strong health. When firing, it emits two separate mortar projectiles. The Mega Turret cannot be disabled with a charged plasma pistol. In Halo Wars 2 the mega turret is a base slot structure exclusive to Pavium once the player has used a leader power to unlock it. Unlike its Halo Wars counterpart the mega turret in Halo Wars 2 is automated similar to the Banished Spike turrets. Pavium himself is able to highlight targets with his target locator though. Also like the Spike turrets, the upgrades apply only to the individual turret that was selected, except that it can be upgraded from War Council. With long range and heavy damage mega turrets are excellent for fighting infantry, vehicles, and even other structures, but they cannot attack aircraft. The only flaw is that due to the size of the turret, it cannot be constructed on Turret slot, and players have to sacrifice one of their building sockets to construct a Mega Turret. The Mega Turret is a popular choice for those who pick Pavium in Terminus Firefight to strengthen defenses, as it is able to cover a wide range that is larger than the UNSC Siege Turret. 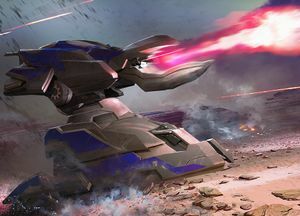 Concept art of the Covenant mega turret for Halo Wars. The Covenant mega turret firing upon attacking UNSC forces in Halo Wars. A Mega turret on the map Crevice in an early build of Halo Wars. The Covenant mega turret on Draetheus V in Halo: Spartan Assault. A Mega Turret destroyed by an M850 Grizzly. Closeup of a mega turret in Halo: Spartan Assault. An M850 Grizzly fighting a mega turret on X50. A trio of mega turrets being used on a minibase in Halo Wars 2. An outpost of mega turrets.